Travel needs vary heavily by company size. A start-up with 20 people might only have a couple of people flying throughout the year, who all book their own flights with the company credit card. But for a multinational company with thousands of employees spread out over the world, it's a totally different story. As the main orchestrator of all employee movements in large companies, travel managers have to juggle a lot of responsibilities. One of these is crisis management — if a flight gets cancelled and the traveler absolutely needs to arrive on time, new options need to be assessed immediately. But there's also personal care — when you know the CEO had a bad experience with a certain hotel, you should make sure not to book it again. All of these things have to be taken care of with respect for the company travel budget. It wouldn't make sense to put everyone in business class, and sometimes employees should consider taking public transport instead of an Uber. It's a complex job. Luckily, things are about to change. Fueled by technological innovation, the travel industry has seen dramatic change over the last decades. While people used to book flights over the phone, most travelers now prefer the convenience and flexibility of online booking to plan their trips. For the same reasons, most companies have made the switch to an online booking tool to manage the internal travel requests. More recently, there has been a wave of cutting-edge technologies that could prove to be a great asset for travel managers. By using tech like chatbots and AI to their advantage, business travel has the potential to evolve into a better experience, while lowering the workload on the humans who have to make sure everything runs smoothly. Modern travel managers have to cater to modern travelers — but what do these expect from their business trips? As it turns out, bleisure — having fun while on a work trip — is one of the most prevalent trends. This interesting hybrid combining private and business travel has created certain expectations about service and ease of use. In a nutshell, the business traveler wants to have a polished, easy-to-use consumer travel experience. Let's imagine what the future could look like. The executive team at your company might need access to a personal assistant that takes care of everything during the trip. They can order your Uber, book a hotel room or get a reservation at the perfect restaurant for your dinner meeting. If your flight ends up being cancelled, they'll whip up a replacement in a pinch. All of this is managed in a 1-on-1 chat with your assistant, making a new request as easy as writing a couple of sentences. Deploying this level of service to hundreds of traveling employees would be an enormous undertaking for a team of travel managers — it would require a large team with 24/7 availability and an incredibly high budget. A digital assistant, however, doesn't have these limitations. It's available whenever you want, replies to your messages instantly and can be scaled infinitely. Also, because there are no expensive humans to be paid, it would be available to anyone — not just C-level executives. The technology behind it could be powered by a self-learning AI, which automatically gets smarter the more it's used. When it makes a mistake — forexample, book a flight to the wrong destination — machine learning makes sure it won't mess up again. 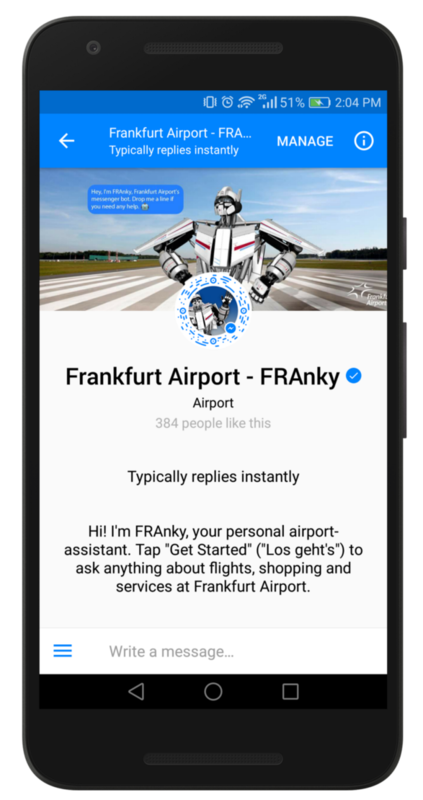 It’s neither easy nor cheap to create a chatbot that can parse any kind of input and take the right action but we can already see several experiments being tested in the travel world – Hello, Hipmunk’s chatbot can help you plan and book your trip while Franky, Frankfurt Airport’s chatbot can help you navigate your way in the airport and update you on your flight status. Chatbots are finding their way into corporate travel management and will soon be a key features for travel managers. When you have lots of people flying around on the company's budget, it's important to keep an eye on how much money they're spending. This is especially important in a time when an increasing number of business travelers is 'going rogue'. Instead of booking their trips in accordance with the company's travel policy, these smart employees pay for everything with their own credit card and submit them as expenses. To make sure employees don't go overboard with spending money on trips, you could consider using a corporate travel platform like Maya. With all information easily accessible from a single dashboard, you control everything — which airlines can be used, if they are allowed a seat in business class and how long they're allowed to stay off site. Travel managers should embrace these new possibilities — a higher level of control over your traveling co-workers can help you stay within budget, while new technology like AI and chatbots can make the service you're providing future-proof.